Vintage - Maling Pottery, Blue Lustre, Biscuit Barrel, in the "Springtime" Pattern #6525, Very Rare, Circa 1950 to 1963. 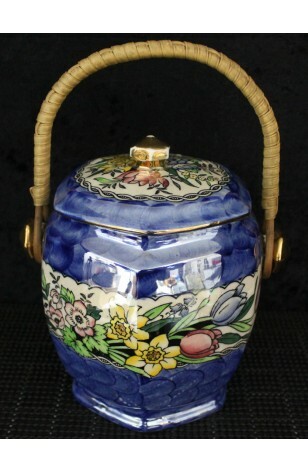 Lovely and Rare Biscuit Barrel, of Blue Lustre, in the "Springtime Pattern #6525. Has a "waved" or "thumb print" Background by Maling & Sons. This is a Design consisting of Tulips, Anemones and Daffodils. All in Vibrant Colors, on Bright Blue Lustre. All Hand Painted. Gold Trim Highlights the Rim of the Barrel, Lid, and Knob. Brown Wrapped Handle for easy carrying. Back Stamps on Base are very clear. Great Condition. Lovely and Rare Biscuit Barrel, of Blue Lustre, in the "Springtime Pattern #6525. Has a "waved" or "thumb print" Background by Maling & Sons. This is a Design consisting of Tulips, Anemones and Daffodils. All in Vibrant Colors, on Bright Blue Lustre. All Hand Painted. Gold Trim Highlights the Rim of the Barrel, Lid, and Knob. Brown Wrapped Handle for easy carrying. Back Stamps on Base are very clear. Very Good Resale Condition unless noted below or viewed in pictures.